This is our compact drone making it very easy to strap to our backs and take into the field. We can take off and land this aircraft from most locations whilst still offering you 4k footage ProRes 4444 QX. This is a really good drone for filming action sports, mountain hiking or flying off from a support Rib. Our Small HD and Connex HD down link that works for all of our drones giving our camera operator a clear aerial feed. We can also divert the signal off to Director’s monitors or to the TV in the comfort of our own van for you. 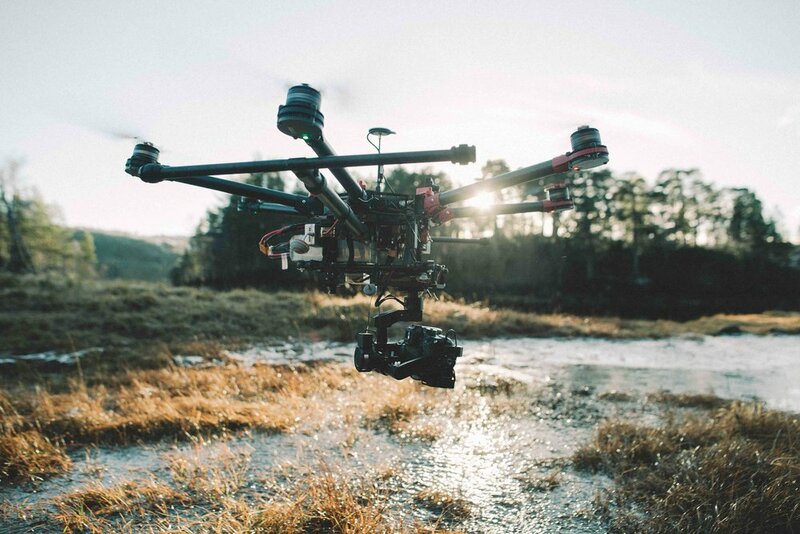 Our S900 is our mid range drone, lifting the Z15 gimbal calibrated specifically for the Panasonic GH4. Consistently delivering stunning 4K footage. We like to use this aircraft for dynamic reveals and landscapes. It is still a very accessible aircraft and can be flown from most places, we also don't mind hiking up a hill with it! The S900 is equipped for taking the GoPro Omni for 360 Aerial Production, please enquire and we can assist with 360 projects. On board 240v power for charging batteries, equipment and drone Lipos. Eberspacher heater - to keep warm in winter months! Tool box for repairs and modifications. LED lights and spot lights. Best of all.. a snack box to keep us going all hours of the day! This is our heaviest lifting drone that can fly a wide range of cameras and lenses for all your aerial cinematography needs. From high end cameras like RED, Alexa Mini, Black Magic URSA, Sony FS5, Sony A7S2 combined with Cine primes and Zooms for maximum quality and consistency. The gimbal can also be equipped with follow focus and remote zoom for a wide range of lenses. We also have the option to top-mount the camera, giving you different perspectives for your production. Please get in contact for enquiries about our heavy lift drone and what camera and lens options we can offer you. We can also deal with camera rentals in-house. This is Freefly latest handled stabilised gimbal that can be used from aerial filming to handled filming in matter of minutes. The Movi pro has capabilities of taking 6.80kg for taking all your camera & lens package needs from Alexa mini, Reds, FS7 and URSA Mini. Our Movi Pro is mapped for handled, Remote or Mimic. Wireless focus, zoom and iris control can be added.